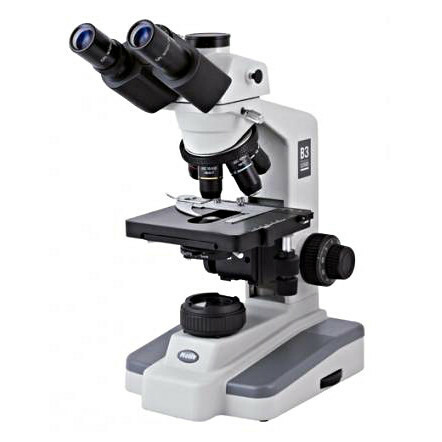 The Motic B3 Series is purpose-built for university-level education and professional microscopy, with a quintuple nosepiece and built-in Koehler illumination as standard equipment. It features a fully rotating, 30-degree inclined binocular or trinocular siedentopf viewing head with 10X widefield eyepieces, 53mm to 72mm of interpupillary adjustment and individual diopter adjustment for each ocular tube. Available in Achromatic Super Contrast or full Plan optics, this new microscope series brings versatility and ergonomics to a wide range of education and professional applications. The standard Achromatic Super Contrast objectives (4x, 10x, 40xS, 100xS-Oil) are housed in a reversed quintuple nosepiece and bonded with contrast-enhancing coatings to produce especially sharp images. This makes them ideal for the teaching laboratory or Life Science applications. The optional full Plan objectives include PL4x, PL10x, PL40xS and PL100xS-Oil. The right hand focus control features finger tip controls while the dimmer switch is conveniently located immediately under the right hand focus control. Both controls can be operated during 'eyes down' observation. Safety features include a rack stop to ensure that the stage does not impact and damage the objectives or slides, and a slip clutch minimizes the risk of damage due to over-extension. The condenser is a professional focus-able Abbe 1.25 NA with iris diaphragm and filter for optimal adjustments. Higher quality Koehler illumination is powered by 12V 20W halogen with variable intensity.